"Earthmen, Come Up" for The Two Kings' Children in Grimms' Fairy Tales, 1920. The Shoes that Were Danced to Pieces for Grimm's Fairy Tales, 1920. 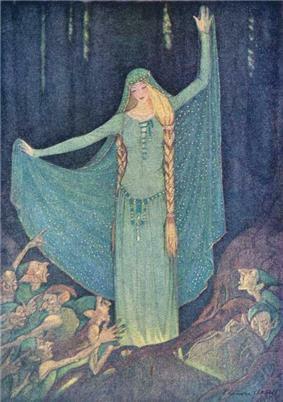 Elenore Plaisted Abbott (1875 – 1935) was an American book illustrator, scenic designer, and painter. 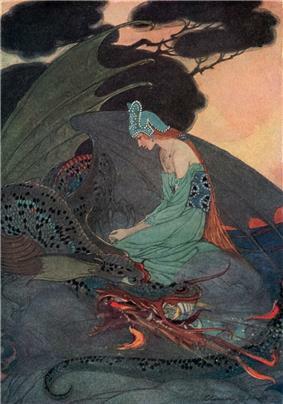 She illustrated early 20th-century editions of Grimm's Fairy Tales, Robinson Crusoe, Kidnapped and other books and magazines. She was educated at three art schools in Philadelphia and Paris and influenced by Howard Pyle. She was among a group of New Women who sought educational and professional opportunities for women, including creating professional art associations like The Plastic Club to promote their work. She was married to fellow artist and lawyer C. Yarnall Abbott. Elenore Plaisted was born in Lincoln, Maine. She studied art at the Philadelphia School of Design for Women, Pennsylvania Academy of Fine Arts, and in Paris, France at the Académie des Beaux-Arts, where her work was exhibited. Abbott moved back to Philadelphia in 1899. She was influenced significantly by Howard Pyle, her instructor at the Drexel Institute. She said later in her life that she created her favorite pieces under his tutelage. Abbott, known for her book illustrations, was also a landscape and portrait painter and scenic designer, including work for Hedgerow Theatre's production of The Emperor Jones. She produced illustrations for Harper's Magazine, the Saturday Evening Post, and Scribner's magazines. Abbott created illustrations for books, such as Robert Louis Stevenson's Treasure Island and Kidnapped, Johann David Wyss's Swiss Family Robinson, Louisa May Alcott's Old Fashioned Girl, and the Grimm's Fairy Tales. Elenore Abbott loves her fairy tales, and no child who receives such a book will be disappointed... Elenore Abbott is not on the surface a clever artist; her active, vigorous yet idealist’s mind is brought into subjection and guides the long sensitive fingers that hold the water color brush. Abbott was a member of the Philadelphia Water Color Club and Philadelphia's Jessie Wilcox Smith, Violet Oakley, and Elizabeth Shippen Green. These women were identified as the New Woman. As educational opportunities were made more available in the 19th-century, women artists became part of professional enterprises, including founding their own art associations. Artwork made by women was considered to be inferior, and to help overcome that stereotype women became "increasingly vocal and confident" in promoting women's work, and thus became part of the emerging image of the educated, modern and freer "New Woman". Artists the, "played crucial roles in representing the New Woman, both by drawing images of the icon and exemplifying this emerging type through their own lives." In the late 19th-century and early 20th century about 88% of the subscribers of 11,000 magazines and periodicals were women. As women entered the artist community, publishers hired women to create illustrations that depict the world through a woman's perspective. Other successful illustrators were Jennie Augusta Brownscombe and Rose O'Neill. Elenore married lawyer and artist C. Yarnall Abbott in 1898 and the couple lived in Rose Valley, Pennsylvania after 1911. Her husband designed the family house with a studio for Elenore and himself. Their daughter Marjorie, named after Elenore's maternal aunt, was born in 1907. When her aunt died, the Abbotts took in her daughters, Sonya and Elenore. Elenore Abbot co-founded the Rose Valley swimming pool, in 1928, which was housed on land donated by the Abbotts and financed by the sale of some of Elenore's paintings. Oh, to Line in the Grass with Pan! "Now and again I stumbled," for Robert Louis Stevenson's Treasure Island, 1911. Delaware Art Museum. ^ Abbott's year of birth is generally stated as 1875 Primary passport and ship registers generally show her date of birth as October 18, 1875, but there are two cases where the date of birth is October 18, 1876. Census records sometimes show her year of birth as 1876, which is an estimate calculation based upon age at the date of the census, rather than an exact calculation based upon her date of birth. A family member believes that her year of birth is 1876, without noting a published source. ^ The Smithsonian also has in its inventory for Brandywine River Museum a painting entitled Peggy Abbott Harvey and Daughter Bret (portrait), 1930, oil on canvas with the source being Catalog of American Portraits, National Portrait Gallery, Index. of Paintings, 1982 and "Brandywine River Museum: Catalogue of the Collection, 1969-1989" Chadds Ford, PA: Brandywine Conservancy, 1991, pg. 153. However, Bret[t] was not born until 1936 and Abbott died in 1935. It is believed by the museum's curator, Virginia O'Hare, that this is a painting of another mother and daughter made circa 1930. ^ a b c .Elenore Plaisted Abbott The Artists Post 1911, Rose Valley Museum and Historical Society. Retrieved March 5, 2014. ^ Library of Congress. Copyright Office. Catalog of Copyright Entries. Part 4. Works of Art, Etc. New Series. 1919. p. 270. ^ Jill P. May; Robert E. May; Howard Pyle. Howard Pyle: Imagining an American School of Art. University of Illinois Press; 2011. ISBN 978-0-252-03626-2. p. 89. ^ Laura R. Prieto. At Home in the Studio: The Professionalization of Women Artists in America. Harvard University Press; 2001. ISBN 978-0-674-00486-3. pp. 145–146. ^ Laura R. Prieto. At Home in the Studio: The Professionalization of Women Artists in America. Harvard University Press; 2001. ISBN 978-0-674-00486-3. p. 160–161. ^ .C. Yarnall Abbott The Artists Post 1911, Rose Valley Museum and Historical Society. Retrieved March 5, 2014. ^ Philadelphia Water Color Club. Philadelphia Water Color Exhibition Catalogue. 1916. p. 46, 48, 49, 50.